Assassin's Creed Odyssey for $27 is back on Amazon for PS4 and Xbox One. Grab it before stock runs out (again)! 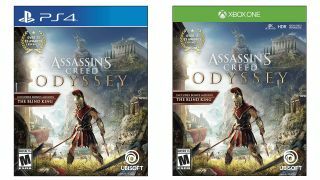 One of the best Black Friday game dealsso far has to be this discount from Amazn US on Assassin's Creed Odyssey, one of 2018's best releases so far, and a superb open world RPG in its own right. Amazon began selling the game for as little as $27 on PS4 and Xbox One earlier this week, down $33 (55%) from its going price of $59.99 (the game only came out last month, remember), but stocks inevitably ran dry as the wisest customers lapped up the offer quickly. But, in a post-modern divine intervention, the deal is back and live on Amazon US right now for both platforms, though it likely won't last for long. That means you need to grab it now and grab it quick before the retailer decides enough is enough for this limited time offer. Trust us, we promise its worth every cent of this amazing $27 deal. A true Black Friday (or should that be Saturday?) bar-gain for every Assassin's fan in the creed. And if you need more, here are our Cyber Monday Xbox One deals and our Cyber Monday PS4 deals.